This year marks 40 years of education and research into the cultural and creative industries at City, during which time scores of alumni have gone on to great careers. Alex Marshall spoke to three leading arts executives to hear about the challenges they face. Andrea Nixon does not make her early forays into the arts world sound like those of a person headed for the heights of the profession. As a student, she took a play about Marilyn Monroe to the Edinburgh Festival only to end up embroiled in legal threats. “I used a very famous photograph of Marilyn for our poster and very quickly learnt the meaning of copyright,” she laughs. Thankfully, those mishaps are long in the past. 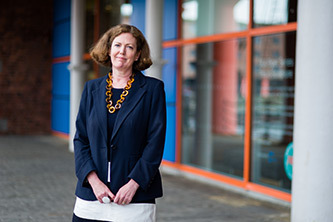 Today, Andrea is the Executive Director of Tate Liverpool (the north of England’s leading gallery) and a key figure in the British art world. A graduate of City’s Arts Administration Masters (now known as MA Culture, Policy and Management), she has extremely fond memories of the University. It helps that she met her husband while studying here in the late 1980s. “He used to help me struggle through accounting and I helped him struggle through essays,” she says. But City also taught Andrea about a topic that’s vital to her current job: fundraising. That may not sound like the most interesting of issues, but Tate Liverpool, like all of Britain’s museums and galleries, is today having to compete with galleries around the world and this means that attracting funds is absolutely crucial. You’re now competing with so many institutions for money – not just other galleries and arts organisations, but schools, even universities – so you have to make sure you have a really good cause. You need to show you’re really adding value to society. Andrea’s fundraising skills have helped Tate Liverpool put on multiple acclaimed shows in her 10 years there, from Andy Warhol’s first retrospective outside London to similar showcases for the likes of Francis Bacon and the Chapman Brothers. However, when asked what she’s most pleased about being involved with, she says something surprising: a dazzle ship. Pim Baxter OBE, another graduate of the MA Arts Administration course and the Deputy Director of the National Portrait Gallery, agrees that fundraising is the biggest challenge facing galleries and museums today. “I’m always aware of the need to generate income, especially as our government grant goes down,” she says, “but I don’t feel like, ‘Crikey, I’ve got to do this.’ Pim is, in some ways, a surprising fit for the National Portrait Gallery. She has only had her portrait painted once (as a teenager) and hated the result (“It doesn’t look remotely like me”) and she only occasionally dabbles as an artist herself. “I normally look at what I’ve done afterwards and think, ‘What is this rubbish?’” she laughs. But she was headhunted while working at the National Theatre and was soon leading the gallery’s work on everything from communications to fundraising. She has certainly been successful. 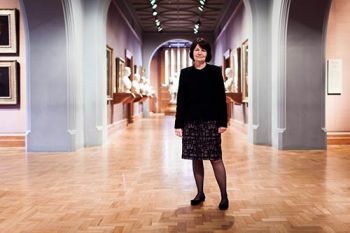 During her time, visitors have soared from 750,000 a year to some two million, something she modestly puts down to the strength of the collection rather than any of her own efforts to raise the gallery’s profile. “If you want a history of Britain, come here, it’s on the walls,” she says. But while talking to her, one message becomes clear: galleries like hers always need to be continually improved and need money to do this. If you’re a fan of the arts, you should probably try and give your favourite one support. If you go round any arts organisation in London, be it a gallery, ballet company or theatre, you’ll see the same names on the walls. What we’re finding really important is to get new members. When I started, we hardly had any, now we have 16,000. It would be great to keep that growing. Before City, Nick was a pianist who put on festivals and so he has “a very clear idea of what it is like to be on the other side of the fence applying for money,” he says. “It was a frustrating process – the time it took, the lack of feedback. And I was convinced there was a better, more positive and constructive way of doing things.” He has tried to change matters ever since. Some of his biggest successes in his current role have involved funding Welsh theatre and the Artes Mundi prize – the UK’s biggest art award. But what would Nick do if he had unlimited money and could stop anyone in the arts world having to worry about budgets? He would establish a programme to reach every disadvantaged community in Wales, he says. The great dream I have is to reach them all. We have pockets of real ingrained poverty here, particularly in the Welsh Valleys. I think the ability to take part in the arts could have a real transformational impact on those communities, giving them a happier, more fulfilling, better quality of life. That’s the power of the arts. That’s why we all work in this field. Alex Marshall, 2003 Periodical Journalism alumnus, is a freelance writer and journalist. His book on national anthems, Republic or Death, was published by Random House in 2015.